The Institute of Animal Genetics owed its existence to a scheme initiated in 1911 to encourage research into animal breeding. The University of Edinburgh was already a leading centre for research in this field, with many leading figures such as James Cossar Ewart (1851-1933), professor of Natural History, physiologist Francis Marshall (1878-1949) and Arthur Dukinfield Darbishire (1879-1915), lecturer in Genetics and Animal Breeding. Francis Albert Eley Crew (1886-1973) was chosen as its first director. 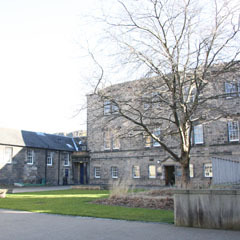 The Institute was based in one of the buildings in Surgeons’ Square until it moved to Kings Buildings in 1924.